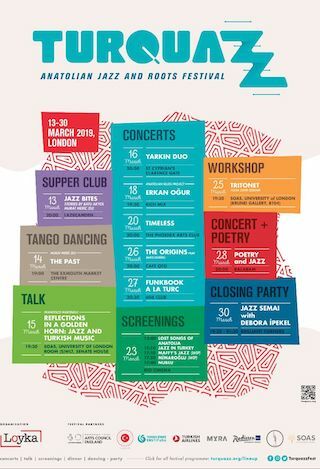 Turquazz: Anatolian Jazz & Roots Festival is the debut edition of a brand new and multidisciplinary music and arts festival in London, shining a light on Anatolian jazz and roots culture emanating from Turkey and its surrounding regions. 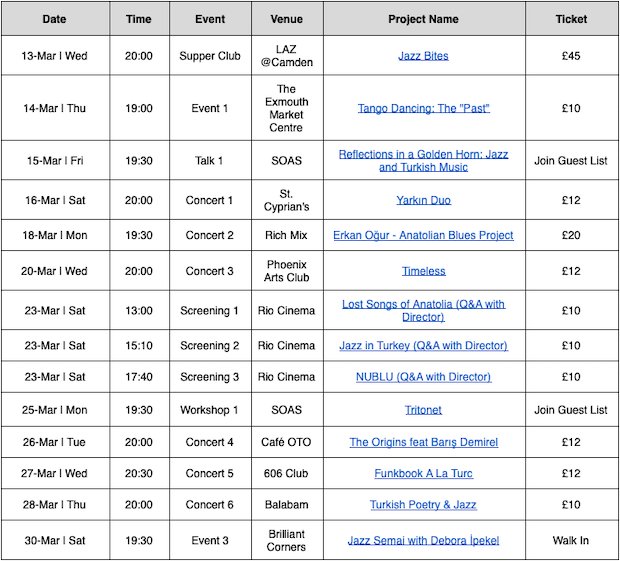 Kicking off on March 13th and running till the end of the month at various venues around the capital, the festival boasts a packed programme of jazz concerts of every persuasion, a film day with screenings of jazz documentaries and work in progress films, talks from eminent speakers on Anatolian jazz, a Turkish tango dance event, a jazz-funk DJ event and a pop up dining experience replete with full tasting menu fuelled with stories brought together by festival director Batu Akyol, the Laz Restaurant’s brilliant head-chef, and DJ Murat Meric - Anatolian jazz without limits! Artists with roots from across the Anatolian region will descend into London as part of this one-of-a kind festival of discovery, engaging and entertaining audiences through a corner of the international jazz jigsaw, little-known outside their region.Turquazz will surely satisfy jazz fans of many persuasions, film buffs, those who like their culture fix a little left of centre and of course, foodies. Whilst it’s not our mission nor intention to define “Anatolian jazz and roots”, we do want to offer an umbrella of activities that we hope reveals the rich intensity, historical progression and unique charm of a diverse jazz culture that has inevitably been influenced by Anatolia and Turkey’s geographical positioning - clinging to Europe and Asia. The concert programme combines a range of artists and sounds from the alternative and experimental side of jazz to the traditional and classical forms well known in Turkey. 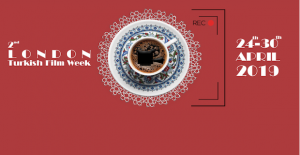 Funkbook a La Turc by Önder Focan and the Şallıel Brothers will see a funk driven assemblage of Turkish songs, going against the mainstream jazz sound of Turkey borrowing from folk and urban styles taking place at 606 Club (27.03). Erkan Oğur’s Anatolian Blues Project at Rich Mix (18.03) sees a master of the guitar and the blues perform this specially commissioned project, a welcome back to London after many years. Brother and sister duo, Yarkın Duo, provide a classical treat through a piano and kamancheh combo (Turkish traditional instrument) at St Cyprian’s Church (16.03). Cafe Oto (26.03) in Dalston plays host to The Origins feat. Barış Demirel where the digital realms of jazz will be taken to the limits and on the other side of the spectrum at Phoenix Arts Club (20.03), piano and bass duo Can Çankaya & Kağan Yıldız perform Timeless, a mix of original and standard compositions. A special poetry and jazz event will happen at Balabam (28.03) which will see Turkish guitarist Önder Focan, bass player Ozan Musluoğlu and poet Tice Cin join forces in pairing literature and music from the Turkish and Anatolian tradition. Jazz Bites is the festival’s food offering taking place at Laz restaurant (13.03) in Camden. A new take on the ‘Supper Club’, DJ Murat Meriç, a storyteller and full tasting menu are on offer with sharing platters, mains, desserts and drinks. Jazz was introduced through tangos in Turkey; Turkish Tango is a variation on the Argentine version and from the mid 1920s onwards was one of the most popular forms of music in Turkey for decades. DJ Murat Meriç will be spinning some very old vinyls with dancing very much encouraged, taking place at the Exmouth Market Centre (14/03). SOAS, the international University in London will be hosting two talks, the first (15.03) given by Francesco Martinelli entitled ‘Reflections in a Golden Horn - Jazz & Turkish music’ and the second (25.03) ‘Tritonet’ by academic Tolga Zafer Özdemir which looks at a new approach to harmony utilising the Tritonet. DJ Debora İpekel, often found on the Worldwide FM airwaves, will close the festival hosting a soiree called Jazz Semai at Brilliant Corners (30.03) playing a mash-up of psychedelia, jazz-rock, jazz-funk and other further out discoveries.